I read this article and found it very interesting, thought it might be something for you. The article is called In Mumbai, Marathwada Migrants Rise Above Poverty Line and is located at https://archive.indiaspend.com/cover-story/in-mumbai-marathwada-migrants-rise-above-poverty-line-79514. A migrant from Maharashtra’s drought-stricken Marathwada region triples her income—if temporarily—after moving to Mumbai, climbs out of poverty and can repay loans, but families must live in 40 sq ft homes, the size of a large carpet, according to an IndiaSpend survey of 60 migrant families. Each adult in these families earned Rs 1,823 per person per month—about 80% more than the official urban poverty line of Rs 1,000 per person per month—within four months of migrating to Mumbai, our survey revealed. Most are farm workers in their villages and work at construction and municipal-infrastructure sites in India’s financial capital. Back home in Nanded in Marathwada, 600 km to the east, each person earned Rs 569 per month, 30% below the rural poverty line of Rs 819 per person per month. Migrants settled for less water in Mumbai—about 43 lt per day per family, down from 115 lt per day in their villages—but they said it was easier to get, without having to fetch it from various distant sources. The average rural Indian family spends 30 minutes every day fetching water, according to the Indian Human Development Survey (IHDS II), which surveyed 42,153 households. 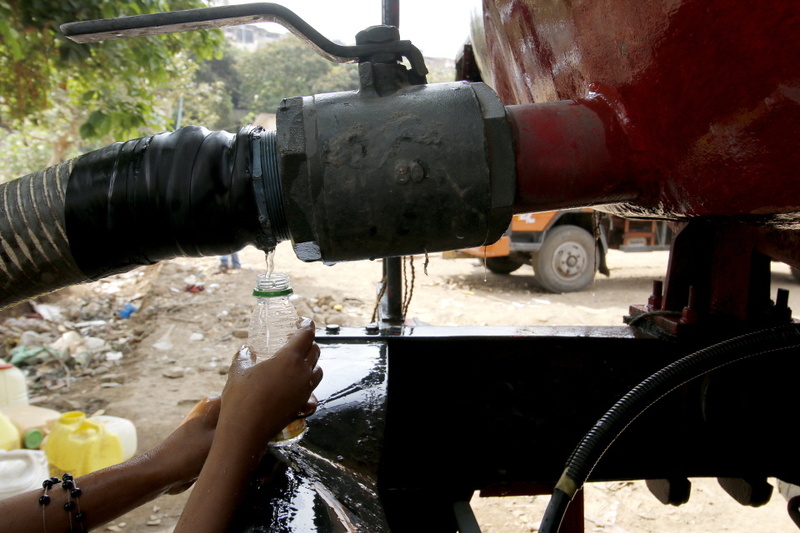 A child at the Ghatkopar migrant camp fills her water bottle from the leakage from the water tanker, sent by local municipal officials. Migrants report that they get 43 lt of water each in Mumbai per day, compared to 115 lt back home, but the water in the city is easier to access. Some of the Rs 266 extra per day the families earned in Mumbai was spent in paying for food, which for three months until 15 April cost twice as much as they paid back home. Their daily expenses of Rs 300 per family per day halved when they started received free foodgrains—rice and tur dal—from Ghatkopar citizen groups. At home, about 72% of the migrants reported getting subsidised grain from the public distribution system; about half the families said children got mid-day meals at public schools. Once school ends in March, families usually assess how much water is available in the village and then decide if they will take them along to Mumbai. This year, the decision was easy to make. As many as 22 of Maharashtra’s 36 districts are in the grip of the second successive year of drought. Families from the drought-ravaged districts have migrated—many more this time than any other years in the recent past, according to anecdotal accounts—to Mumbai, Pune and Aurangabad. 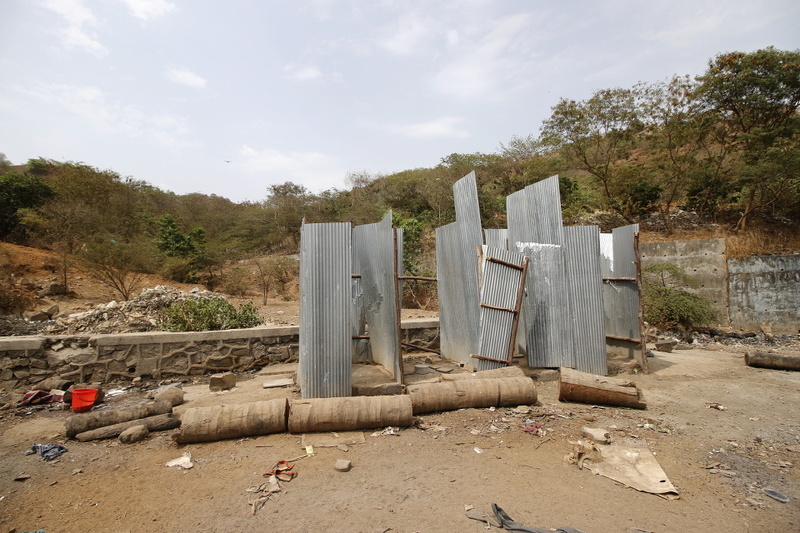 Our sample was taken from among 350 migrant Marathwada families, who live illegally in rough shelters—tarpaulins held up by bamboo sticks—on the edge of municipal open land adjoining a hill in Ghatkopar, a teeming central Mumbai suburb. 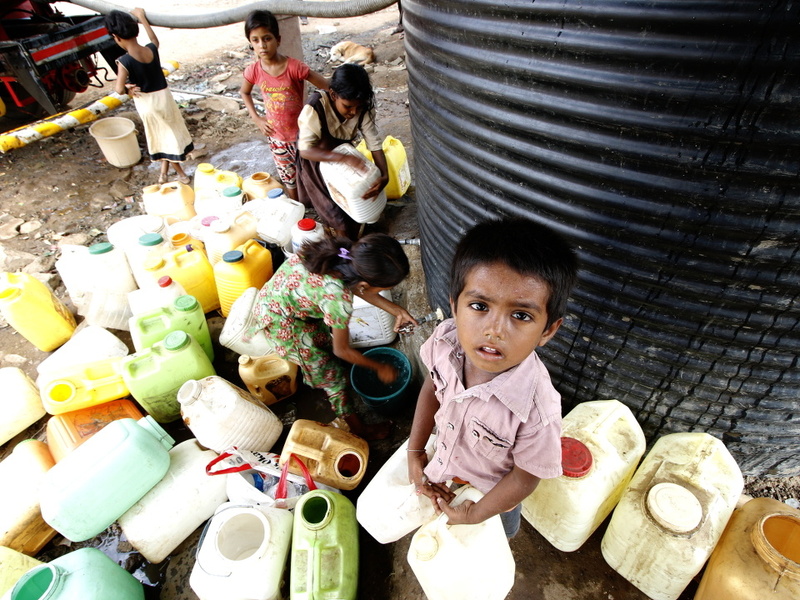 Mahadev, 5, keeps three-litre cans ready near a temporary water tank installed by local Ghatkopar officials. Other children, all below 12, line up their cans and wait for water, which comes twice a day for 30 minutes. The 2016 drought has affected 330 million Indians living in 266 districts across 11 states. It is not clear how many have migrated, but the number is expected to be in millions. About a third of Indians migrate every year, according to the 2001 Census, indicating that rural incomes and government aid programmes are not sufficient. Nine in 10 migrants we surveyed left their Marathwada villages to find jobs. Half had outstanding loans to moneylenders, ranging from Rs 20,000 to Rs 250,000. Almost all of them were confident of earning money in Mumbai and repaying those loans. The 60 families we surveyed in Ghatkopar had grown their income by 214%, tripling it. The migrants share a good rapport with local municipal-labour contractors, planning their visits when municipal and other construction work—building or repairing roads, pavements and flyovers—is about to begin. They leave when work stops during the monsoon. Only 8% of migrants found the Mahatma Gandhi Rural Employment Guarantee Programme (MGNREGA) beneficial, although as many as 47% of them have job cards. The MGNREGA is meant to alleviate rural distress, but the world’s largest make-work programme often fails, as IndiaSpend reported in February, and as the third part of this series details. The second part reveals how while the lack of education and land forces migration, their possession of mobile phones indicates growing aspiration. For the individuals we surveyed, the wage earned for a day’s work more than doubled, from Rs 156 per day per person in Marathwada villages to Rs 334 in Mumbai. 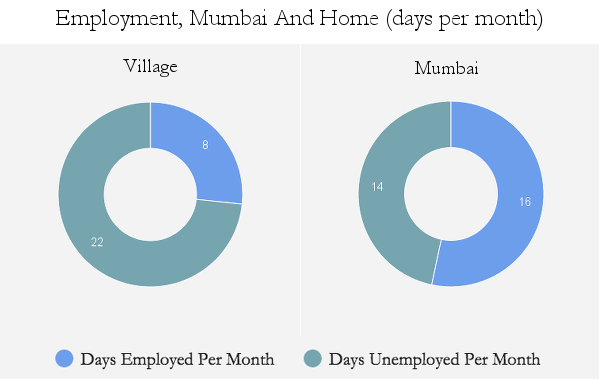 From daily wages, number of working days in a month, and number of working family members, we calculated monthly incomes that families earned in their villages and Mumbai. 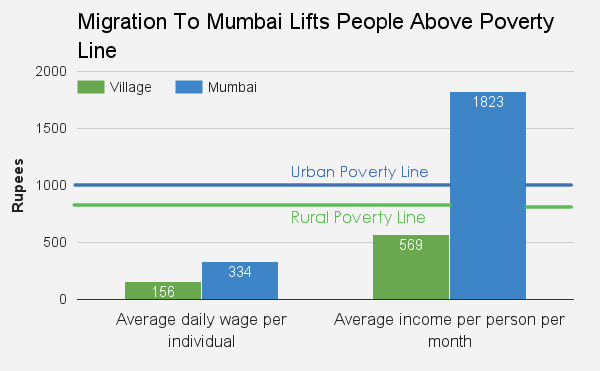 An average family earned Rs 3,730 per month in its village, Rs 11,730 in Mumbai. This tripling of income, was driven, in large part, because migrants found more work—16 working days per month, on an average, in Mumbai, compared to eight back home. This family income is shared by all family members, working and non-working. We calculated the per capita family income by dividing the monthly income by number of family members. A migrant earned Rs 569 per month in her village, 30% below the official rural poverty line of Rs 819 per person per month. In Mumbai, she earned Rs 1,823 per month, 82% more than the official urban poverty line of Rs 1,000 per person per month. 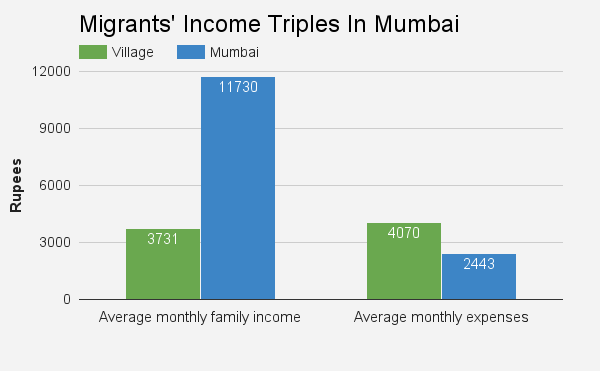 Migrant families earn less and spend more in their place of origin, while they earn more and spend less in Mumbai. “One migrant told me that he is going back to his village with Rs 1.5 lakh savings,” Deepak Hande, municipal councilor of the area, told IndiaSpend. 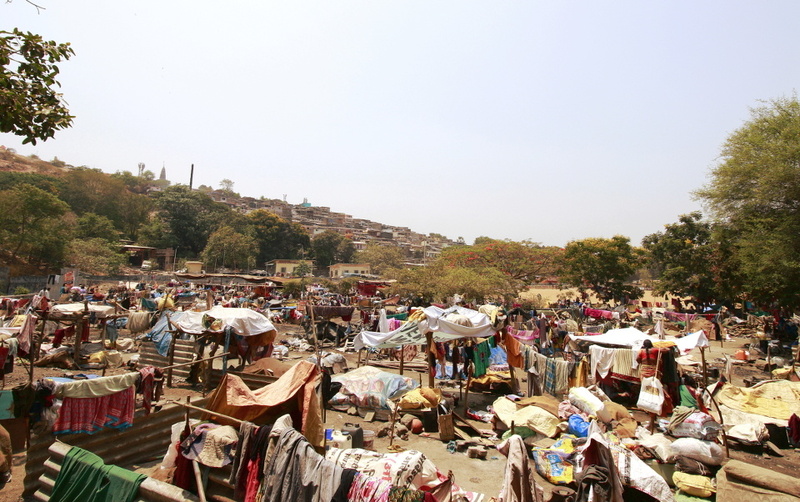 But this economic breathing space is temporary and comes at a degraded quality of life. When their husbands are at work, women staying at the Ghatkopar campsite rush to get to their house fastest. Water available is limited, while the beneficiaries are plenty. If these women do not rush, and fail to make at least four to five trips to the tank, they will have to spend the day with 8-10 lt less water; 40 lt instead of 50 lt. Firstly, they get less water, and, the slower they run, the lesser water they get. When we met Laxmibai Rathod, 30, she was putting her two-year old daughter to sleep on a tarpaulin mat, in the afternoon heat. Rathod was angry with the home she left behind and with Mumbai. “Thikde khayla piyayla nay bhetat an hita gatarichya panyat zopaw lagatay (We do not get enough food to eat and water to drink there, and here, sewage leaks from gutters spread underneath our bed sheet),” she said. A tarpaulin sheet atop four bamboos was the roof; another on the ground served as the floor. Two people lived in about 40 sq ft, where they rested, ate, cooked, slept, breast-fed children, chatted, quarreled and stored foodgrains. Migrants sacrifice living space for better pay. The average size of living space halved, we found—from 115 sq ft back home to 47 sq ft in Mumbai. The largest house size we recorded from their home villages was 1,800 sq ft, while the largest recorded living space in Mumbai was 102 sq ft. The migrants of Ghatkopar—mostly nomadic tribes called banjaras (vimuktajatis in Marathi)—spend three to four months of summer in Mumbai and other water-rich cities, leaving for their villages as monsoon breaks over Mumbai, to hopefully find work as farm labour for the kharif (summer) crop, sowing for which starts with the onset of the monsoon. In the winters, they travel distances ranging from 300 km to 500 km from Marathwada to Satara, Solapur, Pune and Kolhapur districts of prosperous Western Maharashtra, or Belgaum, Gulbarga and Haliyal districts in northern Karnataka, to harvest sugarcane. Uttam Kisan Rathod, 42, has been migrating to Mumbai for 22 years. He has now permanently rented an illegal shanty on a hill near the migrant camp, paying a security deposit of Rs 10,000, Rs 2,000 monthly rent and Rs 500 per month for water and light. 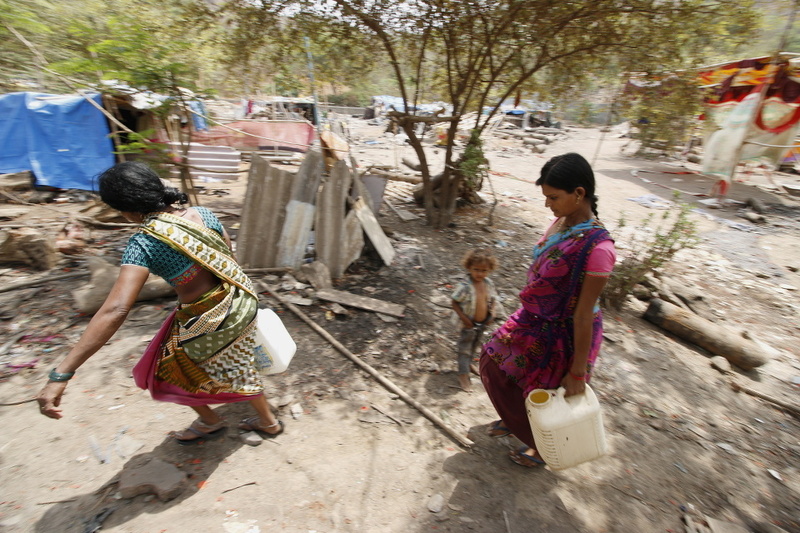 Migrants consume less water in Mumbai, but they get it more easily than they do at home. 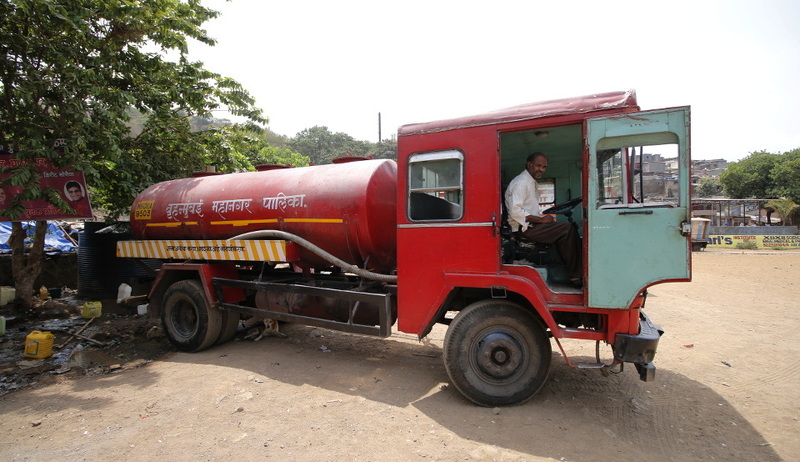 Nivrutti Navhali parks a tanker with 3,000 lt of water to the Ghatkopar migrant campsite. The tanker is unloaded into a plastic tank, which carries water enough to last just two hours for the 350 families. In their home villages, migrants spend Rs 18 every day, on average, for water, which is free, for them, in Mumbai. However, they must use half the water they do back home. So, the men avoid taking a bath, sometimes for three days at a stretch. Temporary bathrooms constructed for migrant women by municipal officials at the Ghatkopar campsite. This the first of a three-part series. Next, Part 2: Short Of Land, Water, Education; Not Aspiration–Babban’s Story and Part 3: Rural Jobs Collapse In 2016 Fuels Migration: Yashodabai’s Story.